Save Preston Park Cycle Track ride. As someone in love with cycling who lives just minutes away from the track, this is a campaign very close to my heart and we must do all that we can to save the track. Preston Park velodrome is the oldest in the country and second oldest in the world – constructed in 1877. One of only nine outdoor tracks in the UK remaining, it has hosted competitive cycling events every year since – apart from this year when British Cycling deemed the track unsafe for racing. The perimeter fencing and track surface is in need of repair, costing an more than an estimated £300,000. Over £2,000 initial fundraising has already been pledged by the local cycling community, which will go towards building a website and further campaigning for the track’s refurbishment. This is not just a campaign to save the track – this is a campaign to preserve and maintain a valuable resource and historic community hub for British cycling. 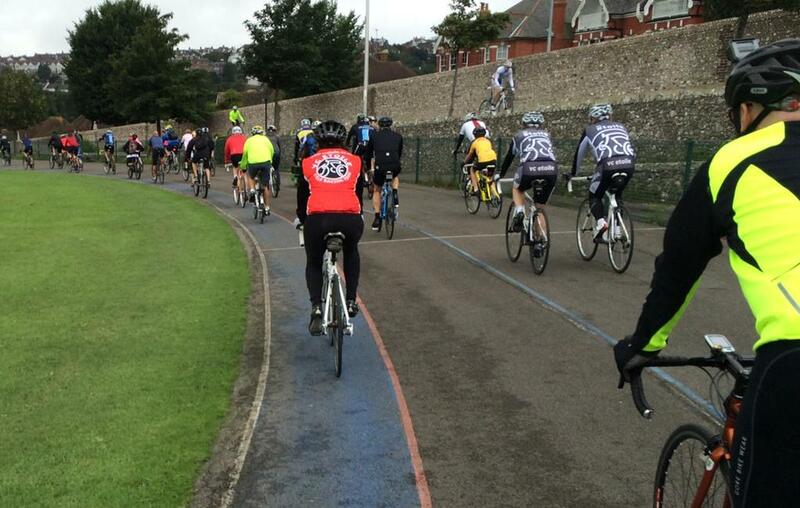 The track has been and still is used regularly by local clubs, groups and independent cyclists, and is a regular venue to teach and mentor young cyclists coming up in the ranks. Various professional cyclists have regularly used the track, including former Tour de France rider Sean Yates, who is supporting the campaign. 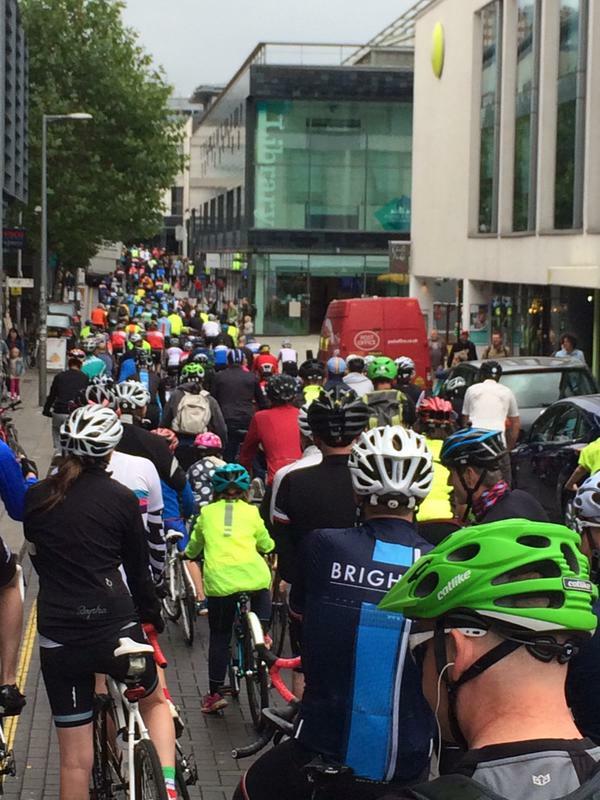 Today’s army of cyclists rode from Old Steine Gardens to Preston Park velodrome with bells ringing, horns tooting and one common goal. I love how Brighton comes out in force for causes like this – but we’ve got a long way to go to ensure the track is saved. 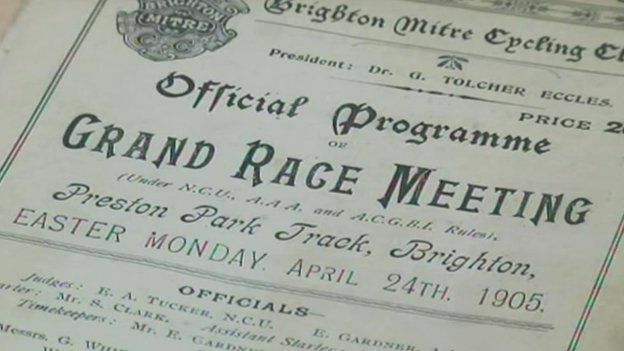 Campaign organiser Rupert Rivett, of Sussex Cycle Racing League, wants to set up a Trust to manage the track and facilities longer term, making further developments to the site such as low level lighting and new stadium facilities for tennis, cricket and cycling clubs. Find more info and pledge your support on the Crowdfunder page, and join the Facebook community and Twitter page.